I’m omitting attributes like quality, performance, and customer service from this with the assumption that when there is relative parity in those areas, the distinguishing factors lean more towards Convenience, Brand Appeal, and Recurring Need. I find that Uber’s Convenience and Recurring Need factors are very high for me. I love their easy-to-use mobile app and I find myself needing the service at least once or twice a week. The Brand Appeal is a bit tenuous especially because of all the negative press I read about it, but the only time I’m really irked is when surge pricing goes into effect. Although I understand that there are economic factors behind surge pricing, the Brand Appeal suffers especially when I see surge pricing in effect at a time when I feel like traffic shouldn’t be that bad. I feel like the company’s values don’t always serve the customer. There is really nothing besides my own laziness stopping me from having Lyft as an alternative on my mobile phone. I love this fast casual salad spot near my work. The Convenience factor is pretty high. Although they don’t offer delivery, I can place an order online through an attractive ordering process and walk a couple of blocks to pick it up. I also like using my mobile phone to pay and collecting rewards (spend $99, get $9). I know that I can get a salad from a dozen other places nearby, but the Brand Appeal, especially the modern and clean aesthetics of the restaurant as well as its website, make me feel good about ordering from them. And because the product is all about seasonal, fresh produce, which aligns with my desire to eat healthy foods, I find that the Recurring Need factor is high. I aim to go there at least once a week. Unless I suffer from a food poisoning episode or move to a farther location, I can see myself continuing to be a loyal customer for some time. I buy all my tops from Everlane. These include t-shirts, oxford shirts, sweaters, hoodies, and sweatshirts. Clothes don’t have the highest level of Recurring Need, but I buy a few items each season. Everlane also has a very beautifully-designed e-commerce website with an easy checkout process and free shipping on orders over $75, which ups the Convenience factor. I count myself a very loyal customer, but lately the Brand Appeal factor has been dropping for me. Recently, Everlane came out with a new line of striped shirts accompanied by a very cute campaign showing a bunch of attractive real-life couples modeling the shirts. I thought it was well-executed and very cool, but a part of me wondered why there were no people of color represented at all in the campaign. I thought to myself, “Maybe this striped shirt isn’t targeted at someone like me.” Totally uncharacteristic, by the way, since I’ve bought from brands that hardly ever use non-white models. But because I am so invested in the Everlane brand and want to continue buying from them, I felt that the brand needed to continue delivering on appeal. I know Everlane has used minority models in other sections, so I am not accusing them of being white models only, but I was nonetheless disappointed by what I found with the striped shirt campaign. I ended up emailing [email protected] about it and promptly received a response that my feedback would be shared with the creative team and that I would be credited $20 for my honesty. It was a nice gesture on their end, and I’ll probably pick up some button-down shirts, but I don’t think I’ll ever want to buy that striped shirt. I fell in love with Cafe Grumpy about 7 years ago when I used to go to their Chelsea location. I have a thing for hand-drawn face logos (I also love Kumon’s logo). When they opened some years ago near our apartment in Brooklyn, I would sometimes trek the two avenues to have their coffee on weekends. The Convenience factor wasn’t high enough for me to become a regular at the cafe, but when they started selling their beans at Whole Foods, I became hooked. And because we go through coffee beans at home fairly quickly, there is always a recurring need every few weeks to buy another bag. Am I a loyal customer? It’s hard to say. If Whole Foods were to switch out Cafe Grumpy for something else, say Blue Bottle, Counter Culture, or a brand I’ve never heard of, I don’t think I would feel too bad. I’ll just grab another bag and see if I like it. I’m not loyal enough to order coffee online and certainly not discerning enough of a drinker to only stick to a certain brand of coffee beans. 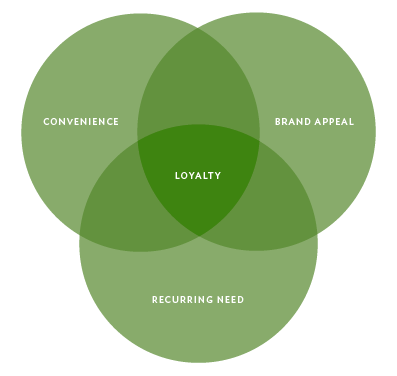 I can see some holes with this Loyalty model, but I also feel like there’s some value to thinking about the way Convenience, Brand Appeal, and Recurring Need play into a customer’s decision to stick with a brand. It’s incredibly challenging to hit all three cylinders at a very effective level. But when it does work, the brand benefits from high customer lifetime value figures. A final, non-digital example: the restaurant downstairs from our apartment, which, eight years ago, initially drew us in with its dark-wood, exposed brick interior and hip Brooklyn-modern menu, has kept its Brand Appeal over the years. The menu hasn’t changed much and neither has the personnel. The bartender and owner know us by name now and greet us warmly. After a long week of work and little desire to flip through Yelp for restaurant ideas, we default to this spot at least a handful of times a month. We know the menu by heart now and get to be testers for new cocktail recipes. We even celebrated New Year’s here recently. The factors at play—Convenience (downstairs), Brand Appeal (interior design, style of food, service), and Recurring Need (we gotta eat and drink)—ensure that for as long as we live here and keep our appetite for the style of food, the restaurant can count on my wife and I being loyal customers for years to come.